Highland’s boys’ and girls’ cross country teams are in the above picture. 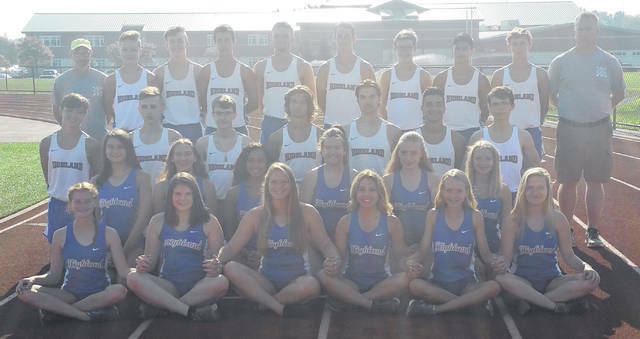 In his eighth year as head coach of the Highland cross country team, Shawn Wilhelm has high hopes for his runners. On the boys’ team, he returns seniors Collin Kipp and Dalton Lee; juniors Bruce Jordan, Alex McCafferty and Zach Wetzel and sophomore Tucker Tague, while not graduating anyone. Helping to achieve those goals will be newcomers Jordan Bellamy, Blake Jodrey and Rider Minnick, whom Wilhelm feels have the ability to compete for varsity spots as the season progresses. Wilhelm expects a tough league race, with potentially 18 of last year’s top 20 runners in the race. Along with his team, the coach looks at Fredericktown, Northmor and Mount Gilead to compete for the title, with MG possibly having the edge thanks to last year’s champion and runner-up in Liam Dennis and Casey White. The girls’ team will have some holes to fill as regional qualifiers Alex DeBord and Sophia Thompson, as well as Madison Chaffee and Olivia Longhenry, having graduated. The team does return five letter-winners in seniors Elizabeth Jenson and Morgan Wilhelm, junior Samantha Trusler and sophomores Heather Ross and Mia White. Also, the coach has high hopes for newcomers Hayley Dailey, Joanna Pauley, Julia Pauley and Camberly Schade, noting they’ve been active all summer long and show signs of helping the team be competitive this season. In the conference race, Wilhelm looks at Mount Gilead to be the favorite, but feels his team, Fredericktown, Centerburg and Northmor will try to provide challenges.